London-born and Montreal-based artist Jeremy Price currently has a show of his recent paintings at Strand Fine Art. 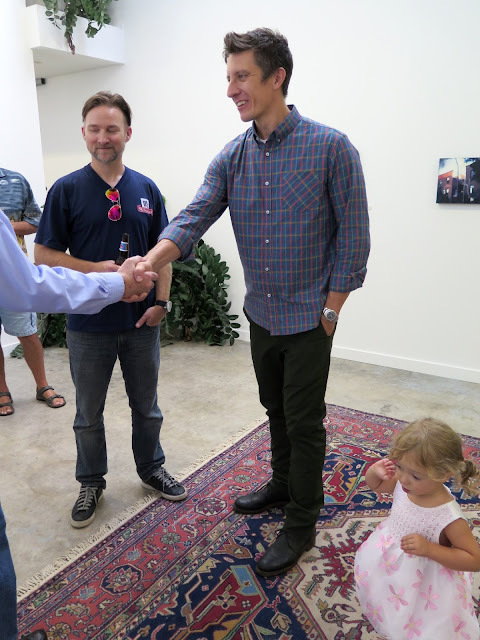 I had seen some of his work previously in group shows and was very taken with it, so when an artist reception was scheduled for this past Saturday I made a point of getting there so I could meet him. The tall man on the right is Jeremy Price. I introduced myself and was surprised (and kind of thrilled) when he said he follows my blog (I had featured a couple of his paintings in posts I had written). There were quite a few members of Price's family present, and the little girl in the pink dress in the bottom right is his niece, who charmed everyone at the reception. 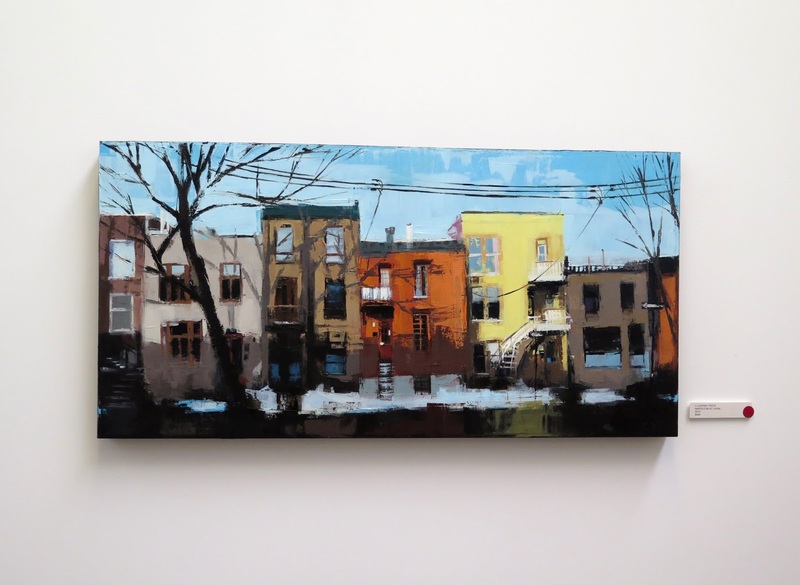 The city of Montreal, where Price has lived since 2008, is the main inspiration for his work. 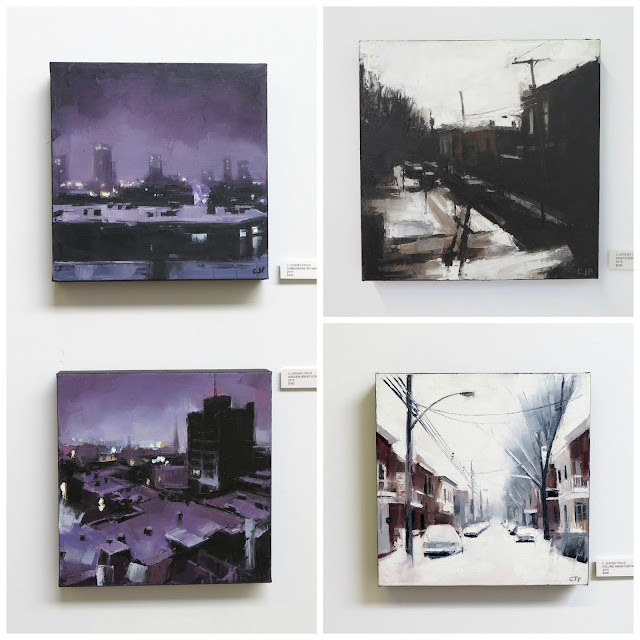 The paintings were divided into three sections: scenes from rural and wilderness settings, scenes of urban life in Montreal and scenes of Montreal streets in winter. Price is a master when it comes to the depiction of light and shadow and this was the first thing that drew me to his work. He paints in oil on canvas, using a palette knife, and works from photographs. 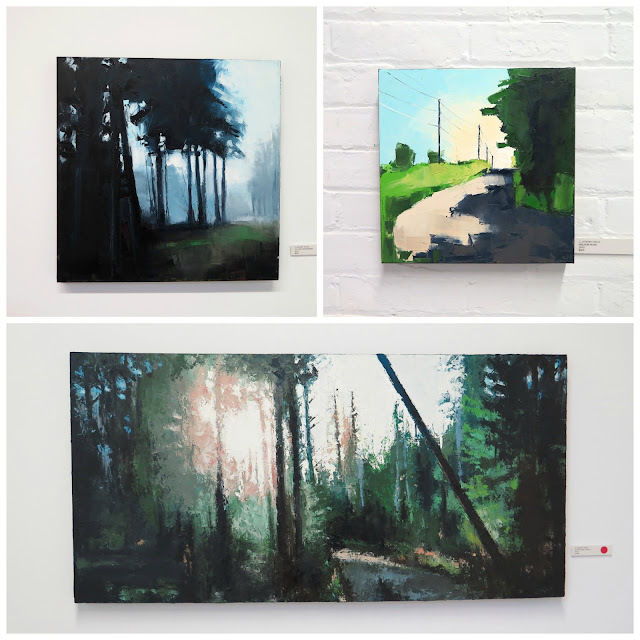 One can always tell where the light is coming from in his paintings; his skill at capturing the quality of light, whether filtered through a grove of trees, the blue of twilight, or diffused by a cloudy winter sky, is exceptional. Some of the titles of his paintings sound like lines from a narrative, as in the one above titled, Keep a Little Fire Burning, However Small, However Hidden. 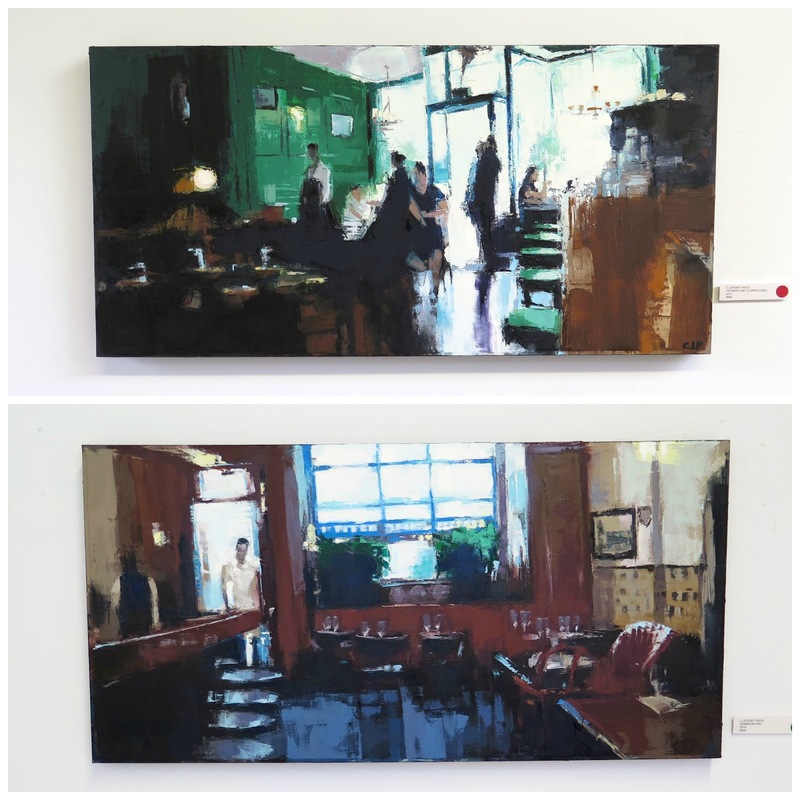 Price has depicted the interiors of Montreal pubs in previous works, but the more recent ones in this show have a more abstract quality - the paint application is rougher, with fewer details. They perfectly capture the atmosphere of a darkened drinking establishment during the afternoon with light pouring through the front windows Part of what I like about his paintings are that they walk the line between abstract and realism, and Price has ability to make your eye believe it is seeing more detail in his work than is actually there. Price's paintings capture a moment in time - a "snapshot" of the scenes he sees while walking, cycling or driving the streets of Montreal. This is one of my favourite pieces in the show, titled Partly Melted by The Prior Days Sun. 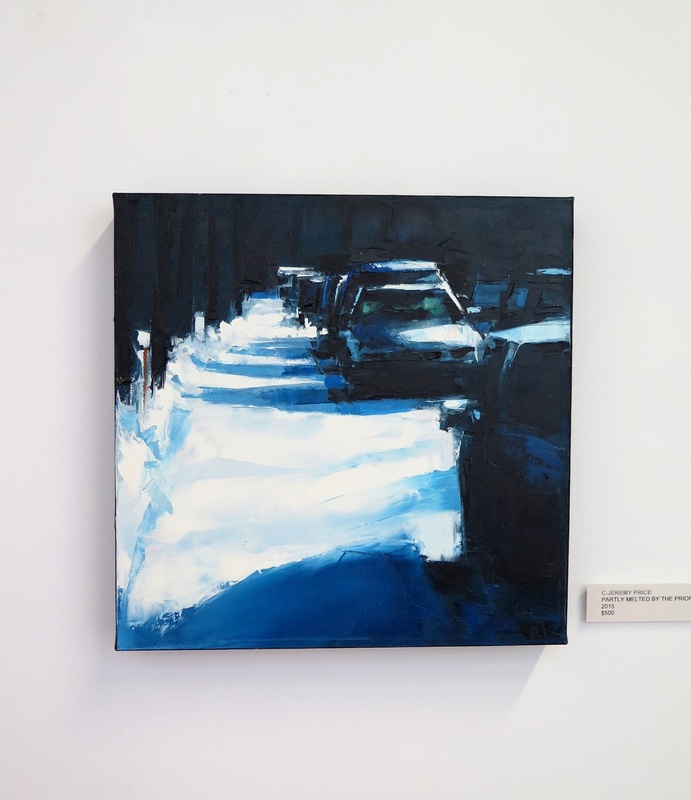 The subject is a common scene to most urban dwellers during the winter, but Price's rendering of the blue light of late afternoon creating shadows of parked cars on a snow-covered sidewalk turns the everyday into an arresting piece of art. Just before I left the reception, I notice this small painting on the wall behind the drink table. The title is Wayne Decle, which may be the name of the man who owned the denim jacket. 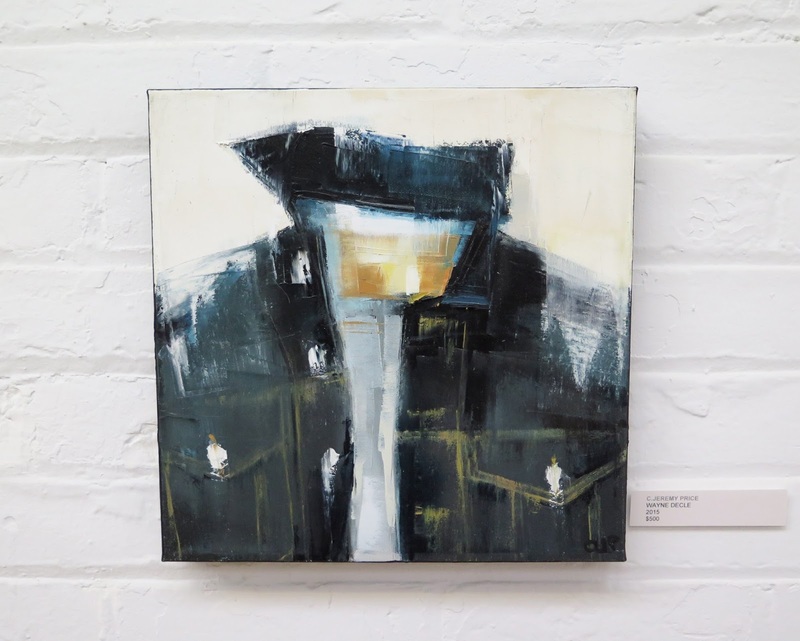 Rendered in an abstract style, the subject is clearly apparent and Price has given it character and gravitas. Oh, wow, I really love these paintings! He really is awesome at capturing the light - it's very difficult to paint with a palette knife alone (I have tried! ), and that's a real skill. I would buy any of those, but I especially like the top pub one (I can see why it's sold!). I can feel the scenes he has painted. The sense of smell is incredibly powerful in evoking certain memories; I find his paintings do that with the sense of light he captures. Wow! I really love his style. So fabulous this is done with a palette knife. I can see why you like his work. His style reminds me of one of my favorite artists Terry Miura. How cool that Jeremy reads your blog! Beautiful review Shelley! You capture the essence of these stunning paintings. Makes me want to visit Montreal next week! What a treat, Shelly! 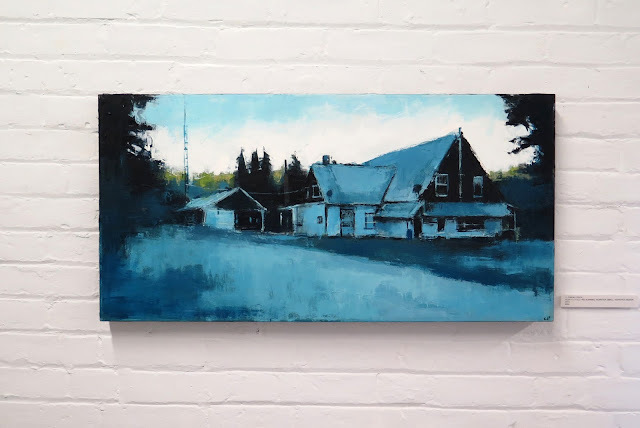 His work is not just atmospheric, they can heat or cool a room ... who knew you could paint the temperature of a scene as well as the light. Great art commentary Shelley and great photos of the art too. They don't always go hand-in-hand. He's lucky indeed to have you as a friend. Thanks. Yes, he really is very good at light and shadow, isn't he?! Way cool! Gorgeous, thank you for sharing this work. This is looking really wonderful dear. I also had been to a similar event at event space nyc last month. It was a great experience and I enjoyed a lot there with learning lots of new things.